Pie dough can be a tricky thing to make. You don’t want it to be too dense, you don’t want to let it get sticky or tacky or gummy. You want it to be flaky and light, you want it to be able to stand alone but not to overpower the pie filling. I know, this sounds terrifying. It’s hard to convince yourself that you want to take it on. 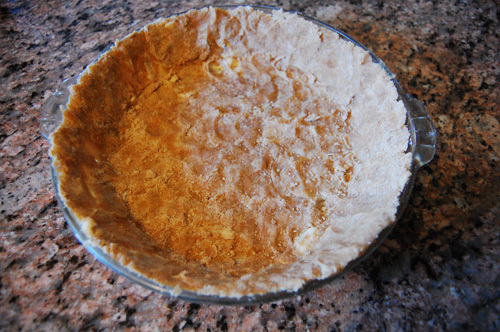 But, I promise you, a pie crust from scratch (and the bragging rights that come with it) is totally worth it. And this is a recipe that is easier that you’d expect, and has turned out brilliantly for me. I do have a few tips for you. I’ve found that when I eat pie, I often don’t eat parts of the crust because they’re flavorless. So my solution was to start baking spices and flavor enhancers into the pie crust. Each pie you make is bound to have a spice profile that can be added to the crust to give it a little pizzaz. For instance, if I’m making a pumpkin pie, I’ll bake some cinnamon and nutmeg into the crust. For a bourbon peach pie, I’d bake honey and brown sugar into the crust. Another thing to keep in mind while making a pie crust is that the refrigerator is your friend. The colder your ingredients, the easier the time will be. 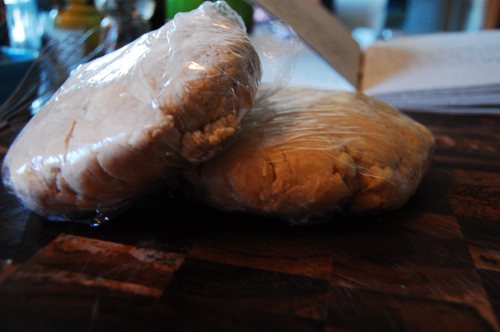 If your dough starts getting tacky and hard to roll or form, just pop it back in the fridge for a bit. It’ll make your life so much easier. Also, if you’re having trouble with your dough sticking to your rolling pin or your counter, try rolling it out between two pieces of floured wax paper. This can really save you a headache. Finally, this recipe makes enough for a top and bottom crust. If you only need a bottom, you can freeze the remaining dough for up to a month. When you’re ready to use it, I suggest you take it out of the freezer and let it thaw completely in the fridge. Other than that, just stay positive. In a world where homemade often means bought from the store and cooked at home, a scratch pie is deeply satisfying. Form a ball and divide it in half. Cover each half with saran wrap and flatten into a disc shape. Pop in the fridge for at least half an hour. 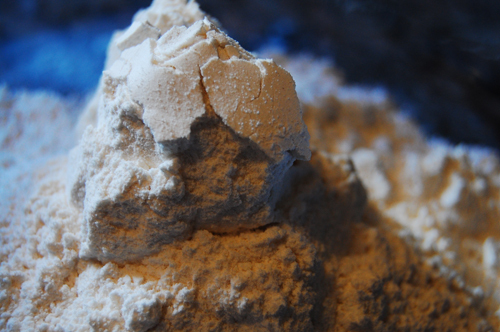 Take half the dough out of the fridge, and roll it out on a lightly floured surface. It also helps to cover your rolling pin with flour. Fit the dough into your pie dish, and roll out the remaining dough. If you’re making a traditional, close top pie, lay the rolled out dough on top of the filled pie, and pinch the top and bottom crusts together. You can then go back in with a fork and crimp the edges. 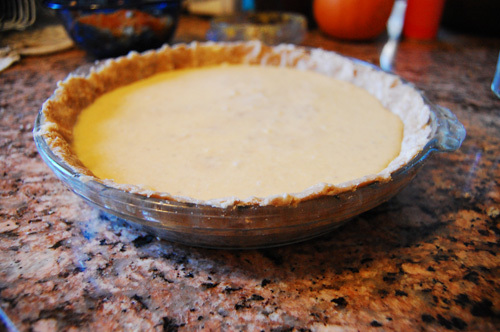 Don’t forget to cut slits in the top so the pie can let out some steam. If you’re making a lattice top pie, use a knife or pie cutter to cut strips. Weave them together, and sprinkle with sugar. To me, fried chicken has always been synonymous with boating. For reasons I can’t explain, fried chicken is the perfect boat/beach food. That and cookies (my favorite corny stepmom moment was when she pulled out a package of cookies and said “Chips A’hoy, get it?” It was perfect). Anyway, everytime we went to the beach or out on the boat, fried chicken from Bojangles or somewhere else came with us. And it always made me so happy. Something about the salty chicken washed down with cold soda and spray from the ocean epitomized summer for me. As for making it on my own, that’s a different story. I’ve watched other people make it, and I myself have made lightly breaded, lightly fried chicken, but never what most people would consider authentic fried chicken. So, this was an adventure. 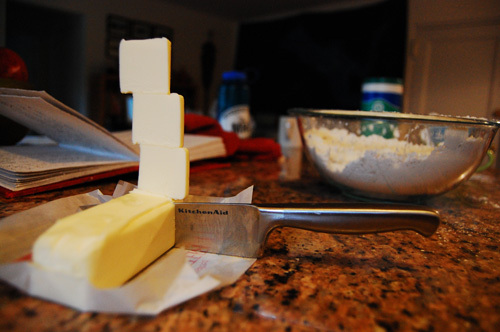 I based my recipe on Paula Deen‘s recipe, which she credits to her Grandma Paul. Now, I know people who say they don’t like Paula Deen. Granted, most of them are from above the Mason-Dixon line. But I adore this woman. My friend Chris and I read her autobiography It Ain’t All About the Cookin’ last summer and I was sold. I can’t say that I feel compelled to experiment with her non-southern dishes, I absolutely adore her when she sticks to her agoraphobic, comfort food roots. As for the merits of this particular PD recipe. It was an easy, to the point recipe to follow. When I’m making a new food, I like to vet the recipe by comparing it with other similar recipes, just to make sure the author isn’t way off base about something. Paula Deen was way off base with this recipe’s cook time. She suggested 10 minutes fry time for white meat, 14 for dark. 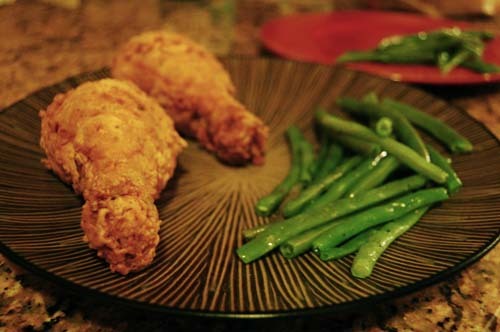 I chose to fry just drumsticks, my favorite part, which is considered dark meat. Everywhere else I looked suggested 10 plus minutes per side, so I ended up frying them for about 25 minutes. I also double dipped the chicken, mostly because my favorite part of fried chicken is the fried part, and it’s so much crispier if it’s double dipped. 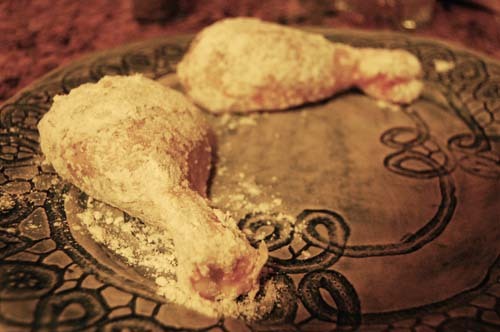 I had five drumsticks, so I fried them in two batches. I tried two different methods of frying, in order to test the merits of each. With the first batch, I flipped them every two minutes. The second batch I fried for 8 minutes on each side, plus a few minutes on a one minute rotation to even out the cooking. I found that the first method produced a much more evenly cooked piece of chicken, so I recommend that. Other than that, expect to get oil all over your stove top. Expect to get popped a few times. And expect delicious flavor. According to Paula’s grandmother, your chicken should stand, seasoned, in the refrigerator for at least two hours. 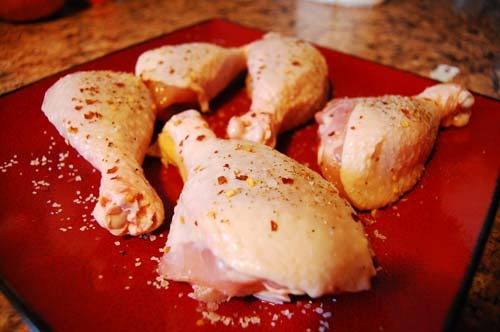 So begin by seasoning your chicken and putting it in the fridge to hang. When it’s time for cookin’, go ahead and pour your oil into a cast iron pan. The ideal temperature for your oil is 350*. I have a twelve inch cast iron pan, and I poured 32 ounces of peanut oil into it. 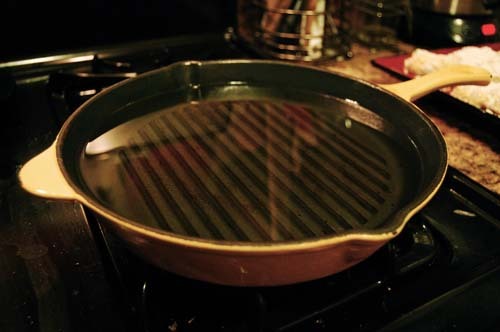 Your oil should be about an inch deep, so depending on the size of your pan, the amount of oil will vary. Whisk the eggs with the water. 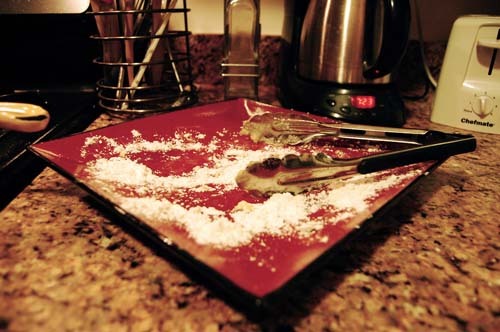 Mix the pepper, the red pepper, and the flour together, and place in a shallow bowl. The best way to bread your chicken is a factory line setting. I had the plate with the chicken, the egg mixture, the flour, and a plate waiting at the end. When it was time to double dip, I rinsed off the first plate and switched them. So, dip your chicken in the egg, dip them in the flour, and repeat. Once your oil is the right temperature, gently place the chicken in with tongs. Gently mostly so you don’t make such a mess of your floor and stove. Set your timer for twenty minutes, and flip the chicken every two minutes. The chicken should get very crispy and should appear a little more brown everytime you flip it. If at twenty minutes it hasn’t reached that golden brown color that chicken should be, keep going, flipping every one minute. Gently remove from oil, let cool slightly, and serve. *A note on what to do with your oil. I’ve spent enough time watching my father fry things in peanut oil and cook in cast iron pans to know that there are some things that get better with age and use. Both your pan and your oil will gain flavor and seasoning from this experience. So if you’re going to fry again, keep your oil. If you’re not, put your oil back into it’s container and throw it away, or try and find an oil recycling program in your area. If you pour it down your sink the only person you’ll be hurting is yourself… the plumbing bill will outweigh any time saved by dumping it. Pumpkin pie was one of the first things that I learned how to make. Using canned pureed pumpkin, my grandmother made it frequently throughout the fall and winter, along with fresh whipped cream to accompany it. 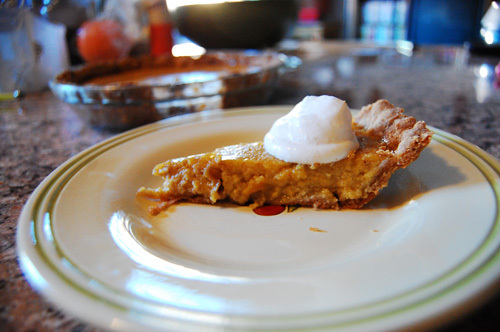 I love pumpkin pie, and always have, so it was a recipe that I dedicated myself to mastering. When my grandmother died a few years ago, it became my responsibility to keep making the recipes that my father didn’t know how to make. The first time he had my pumpkin pie, he looked at me and exclaimed “Bobbie taught you how to make it!” Now I was in a predicament. You see, my grandmother’s recipe was loosely based on the recipe given on the side of the Libby’s can. My father wouldn’t believe me, so finally I conceded that my grandmother had made the recipe her own, which was not entirely a lie. Now I’ve been making that Libby’s variation for years, and there’s a special place in my heart. But this fall, with a year-round farmer’s market mere blocks from my house, it seemed wasteful not to use a real pumpkin. 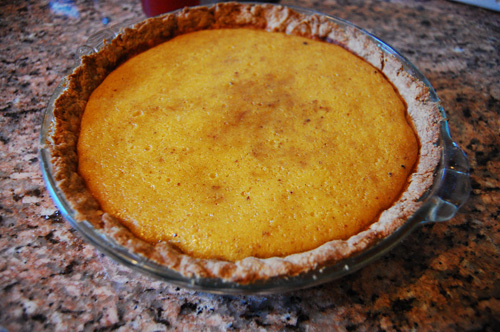 So, this morning, I set out to make a completely from scratch pumpkin pie, based on Rebecca Wood‘s recipe. After an embarrassing moment at the farmers market when, in front of the merchant, I wrongly identified a squash as a pumpkin, I set off. The recipe, which tastes better than I imagined, had a few issues. For one, the dough. Now, I always tell myself to keep an open mind about dough, because there is that chance that I could happen upon a great recipe. This was not a great recipe. It was too hard and fell apart all over the place when I tried to roll it out. I ended up piecing it together in the pie dish, which is not ideal. To it’s credit, it did taste fine. But what crust doesn’t taste fine with all the spiced goodness that is pumpkin pie on top of it? 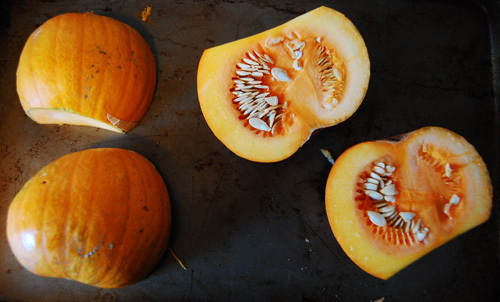 Also, the recipe calls for one sugar pumpkin to yield two cups of puree. Now, I bought two pumpkins that were labeled “p” for pie-worthy. They were normal sized smallish pumpkins, but the puree of the two barely made a cup and a quarter. So, when you’re making this, try and find bigger smallish pumpkins, or buy three. Other than that, and the fact that it was not quite as orange as I expected it to be (blame my shortage of puree), it was a yummy recipe, one that I will make again (with better dough). 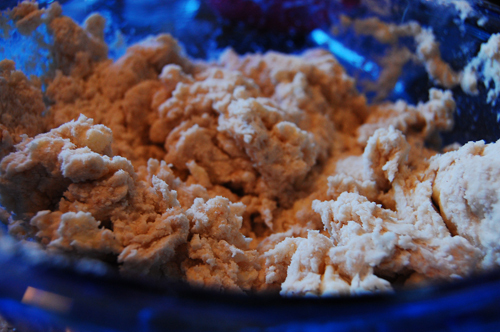 Start with the dough, since it will need to refrigerate. Mix together your flour, spices and salt. Knead in sliced butter until the texture is like corn meal. Slowly drizzle in water, and with your hands or a wooden spoon, mix together until a dough forms. Flatten into a disc, cover in plastic wrap, and refrigerate for one hour. Preheat your oven to 350*. 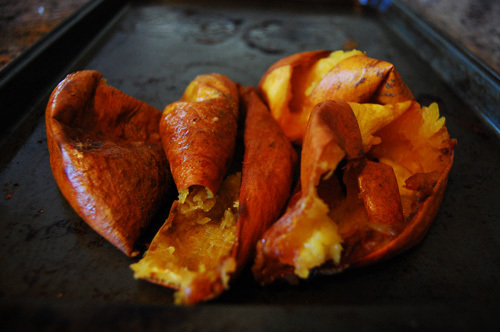 Slice the pumpkins in half, gut, and bake, shell side up for one hour. Let cool a little, and then scrape the pulp out of the shell. 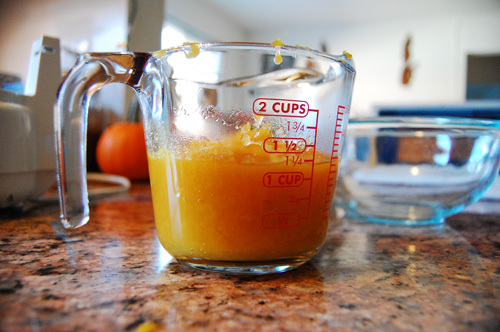 Puree in a blender or food processor, until smooth. Put aside. In a medium mixing bowl, beat eggs. Add in puree and heavy cream, using a whisk to incorporate. Add spices, and stir until totally mixed. Raise temperature to 425*. Press dough into pie shell, and pour pumpkin mix into shell. Bake for fifteen minutes at 425*, and then for forty minutes at 350*. Pour cream into medium sized bowl. Using the whisk attachment on your hand mixer, start mixing at a medium speed. 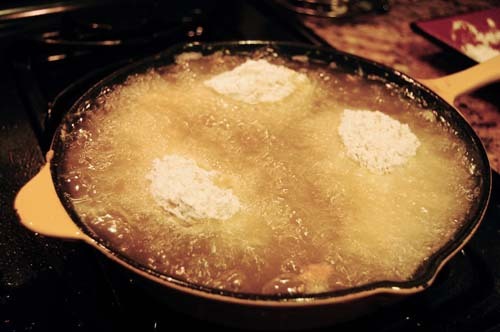 When the cream starts to thicken, add the sugar, vanilla, and spices. Continue to whip until soft peaks form. Plop a dollop on top of your pie and serve.